Studying the early development of the brain reveals structural and functional relationships between the portions of the adult brain. Since the early development of most vertebrates is similar, the 60-hour chick embryo can serve as a study organism roughly equivalent to the 5-week human embryo. See Martini, 5th Ed, pp 438-439, & handout from Balinsky (next page in packet). Note: This prepared slide is unusually thick, so it is especially important to follow correct microscope protocol. (Do not ram the slide with the objective). Also, since the specimen mounting medium softens as it warms, remove the slide as soon as you are done, and allow it to cool flat on the surface of the desk before you return it to the slide case. Use the 4x objective to locate, illustrate, label and describe the bolded features of the chick embryo in the following table. 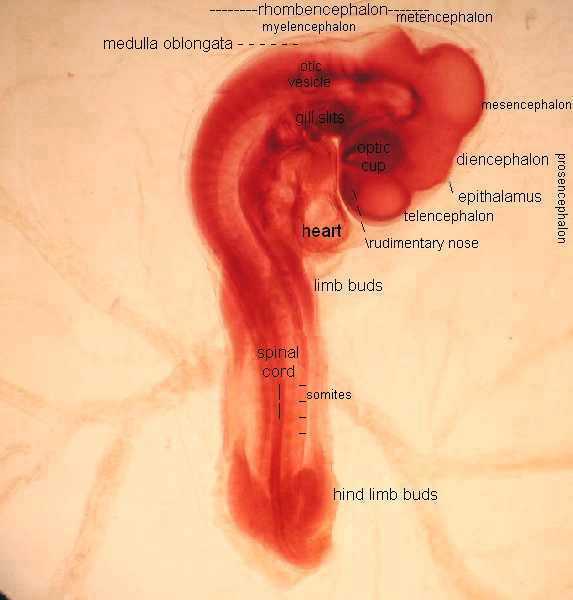 As a study aid, here are two views of the 60-hour chick unlabeled and labeled. Slide 7. 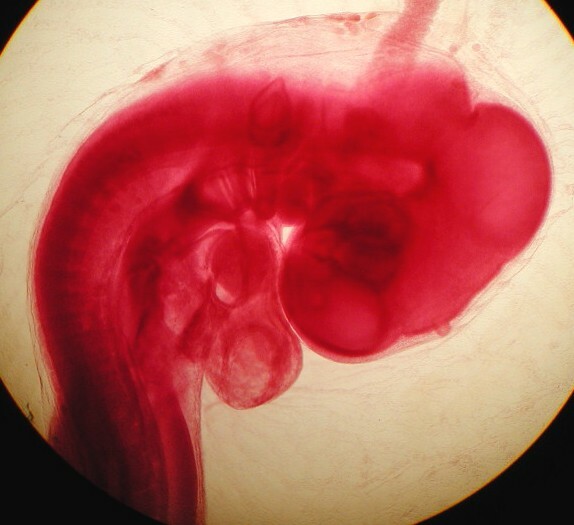 Chick, 60-70 hour, whole mount, chicken (H 2195) Unlabeled: 40x chick embryo Labeled: labeled 40x chick embryo. * These constitute the brain stem, which regulates consciousness and some autonomic reflexes: respiration, coughing, swallowing, cardiovascular control. When finished illustrating the embryonic brain, a brief, student-graded 10 question quiz will be given to see how well these features were learned. LECTURE NOTES: A&P 2002, Winter Quarter . LABORATORY HANDOUTS: directory of pdf files for A&P 2002. Here is an image bank for the First Test from which point and name questions will be drawn. Here is an image bank for the Second Test from which point and name questions will be drawn. Here is an image bank for the Third Test from which point and name questions will be drawn. Here are labeled images from Winter Quarter, A&P 2002 for review for the final exam. 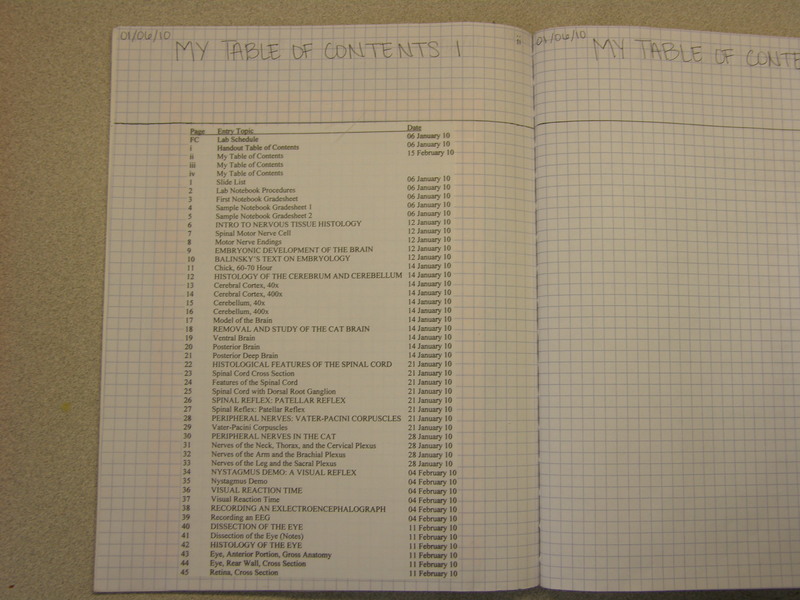 Here are sample pages from the recent Notebook Grading, 9 February 2016. New Students must mount these protocols in their notebooks. All Students are responsible for them and should know them. 24) Electrocardiogram Protocol Here are EKG tracings for you to review and analyze: p. 1, p.2, p.3, p.4 Here is a nifty animation of the heart pumping correlated with the EKG (electrical activity of the heart). 25) Anatomy of the Circulatory System in the Cat, and the Anatomy of the Human Heart Anatomy of the Deer Heart. Here is an animation that shows the flow of blood through the heart.